These incredible dresses are made of something unique... can you guess what it is? This past September, Kruger Products of Canada sponsored the Fifth Annual White Cashmere Collection 2008: A Touch of Pink fashion show. Eight leading Canadian designers created elegant dresses using Cashmere, Canada's best selling bath tissue. 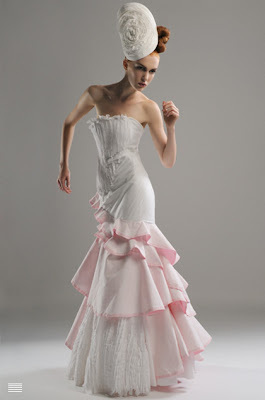 The designers were requested to incorporate Pink Cashmere into their white dresses. The limited edition pink tissue has been sold across Canada as a fundraiser for the Canadian Breast Cancer Foundation. You can see more fabulous dresses and read about the designers on the Cashmere website. Contestants were challenged to create an original fashion statement using Cashmere. Carol, who plans to attend fashion design school, entered the contest after seeing it promoted on Project Runway Canada. The Versace-inspired gown took more than 10 hours to construct and required 66 rolls of tissue. Carol's prize is a trip for two to New York City's Fashion Week this fall. These are absolutely incredible, great post! What gorgeous dresses. I would love to dress up in a dress like this at least once no matter what it is made of. These are just amazing. Thank you for sharing. OMG.!! 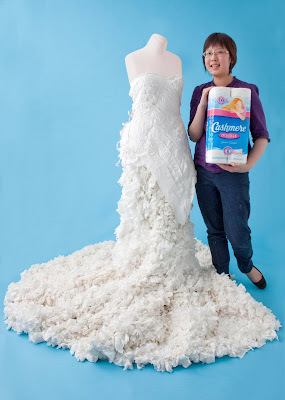 Its really amazing and hard to believe that those beautiful dresses are made from cashmere bath tissue. Absolutely INCREDIBLE.